Find news, links, resources for more on understanding the minimum wage, the implications of raising it, and what is happening across the bay and country. 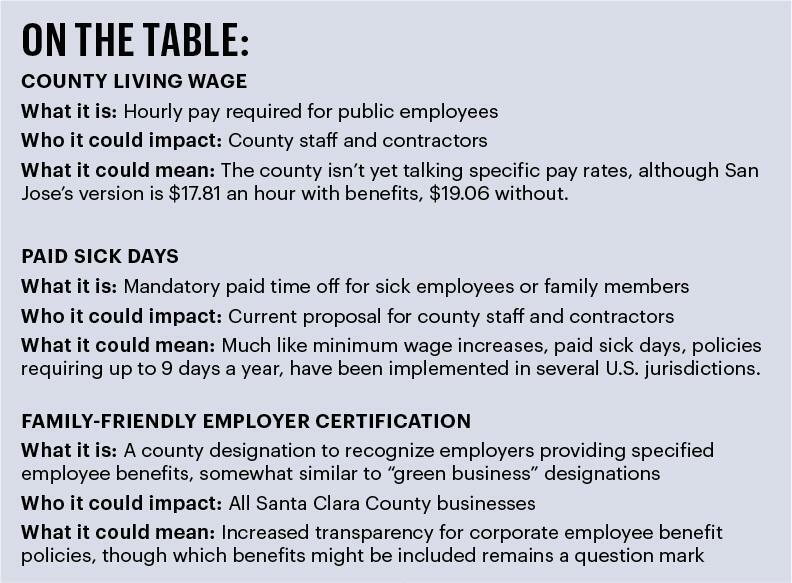 A sweeping labor policy proposal winding through Santa Clara County’s political process could raise wages for public employees, require paid sick days for workers and implement a new labor-friendliness ranking for businesses based on benefits plans. While major metro areas like San Francisco, Washington D.C. and Seattle have seen similar reform efforts play out individually in recent years, the initial effort in Silicon Valley to combine the set of policies appears to be unprecedented. It’s also likely to run into familiar warnings about job cuts and other negative economic impacts from business advocacy groups or employers whose bottom lines stand to be impacted by labor cost increases. The focal point of the new proposal is the county’s living wage, or the pay required for county staff and contractors (as opposed to the minimum wage required for all workers). The city of San Jose has a living wage law on the books that ties pay for city workers and contractors to area costs of living, which — in a market roughly 87 percent more expensive than the average U.S. city — pencils out to $17.81 per hour for employees with health benefits or $19.06 without. A minimum wage hike in San Jose, Calif., has resulted in more, not less, jobs. Critics of raising the minimum wage claim it will hurt businesses and cost jobs, but the experience of one California city is refuting the naysayers. 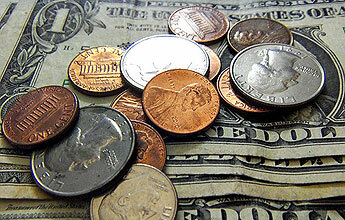 San Jose raised the local minimum wage in March 2013, from $8 to $10-an-hour. It was raised an additional ¢15 an-hour in January. $10.15-an-hour isn’t much, but it far exceeds the federal minimum wage of $7.25-an-hour. Cherry Lunario, a home care worker in San Jose, says the $2-an-hour raise she got in March 2013 was not a ticket to high living … [But] Lunario, who worked and lived in a home for mentally disabled adults when the increase took effect, says her raise provided about $200 extra a month after taxes. She was able to afford to fix a cracked filling in a tooth after postponing dental visits for several years. While giving more than 70,000 San Jose workers a long overdue boost to their paychecks, the raise has had no negative effect on the jobs market – in fact the unemployment rate is down, falling 2 percentage points since 2013. The restaurant industry – one of the sectors most affected by the wage hike – is seeing strong growth, with the number of restaurants in the district increasing 20 percent in the past 18 months according to the San Jose Downtown Association. Indeed, contrary to business rhetoric, studies reveal that that higher minimum wage levels do not force employers to lay off workers. In a study published in the Review of Economics and Statistics, economists Arin Dube, William Lester and Michael Reich compared counties adjacent to state borders, where one state raised the minimum wage and another did not, between 1990 and 2006. They found conclusively that raising the minimum wage had no impact on employment. A similar study by Alan Krueger – now the head of the Council of Economic Advisers – came to the same conclusion. The Obama White House also noted that Costco, the retail discount chain, Stride Rite, a children’s shoe chain, and other firms have supported increasing the minimum wage, saying it reduces employee turnover and improves workers’ productivity. America is treating its low-wage workers so badly that it’s starting to get shamed by the rest of the world. The International Monetary Fund on Monday cut its forecast for U.S. economic growth this year, warned of sluggish growth for years to come, and made a bunch of suggestions for getting America’s economic house in order — including raising the abysmally low federal minimum wage of $7.25 an hour. The IMF didn’t say how much it thought the minimum wage should be, exactly. President Barack Obama has proposed an increase to $10.10 an hour. If the minimum wage had been adjusted for inflation regularly, it would be at least $10.68, according to the National Employment Law Project. Many fast-food workers would prefer $15 an hour. If wage floors had been raised to keep up with productivity, then they would be closer to $22 an hour. However you figure it, the wage is too low, and one of the lowest among the world’s developed economies. The point is moot at the moment, because Republicans in Congress want nothing to do with a higher minimum wage. States and cities are starting to take matters into their own hands, led by Seattle, which recently raised its minimum wage to a highest-in-the-nation $15. In fact, Republicans in Congress oppose many of the suggestions the IMF made for getting U.S. economic growth moving again, including infrastructure investment and immigration reform. Without such things, the IMF said, it expects U.S. gross domestic product growth to average 2 percent a year for “the next several years,” below its historic average of more than 3 percent. The IMF also cut its forecast for growth this year to 2 percent from an earlier estimate of 2.8 percent.